January 19, 2015 12:49 IST by Eliza Lobo	in Tips And Advice. One of the most important aspects of driving is manoeuvring the car in busy urban roads. With the number of cars increasing several manifolds every month, it has become quite tough to drive safely on urban roads, especially those in metropolitan cities. Most online searches are related to the aspect of how to drive car in city traffic. As a result, the online world is replete with car driving tips and basic guidelines to master the driving on urban roads. However, safe driving tips are not the only aspect that is to be kept in mind while taking out your vehicle on urban roads. A number of protocols are to be maintained for a safe trip, be it on highways or on the urban roads. Driving on city roads can be extremely boring as well as frustrating as most of the time the driver has to keep a check on the clutch and brake rather than putting the foot down on the accelerator. When the traffic builds up, it is almost standstill and the vehicles move up at a much slower pace. The best way to get accustomed to this problem is to maintain a slow speed on most circumstances. 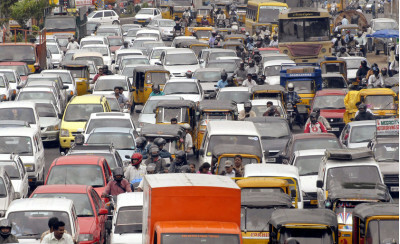 The faster you drive on urban roads, the harder you have to apply the brakes in an urban snarl. On one hand, this increases the frustration in the minds of the driver, while on the other; the chances of collision are increased. While turning, some drivers often ignore the usage of indicators. While this might be termed as carelessness on some occasions, sometimes it might be the cause of dangerous accidents. Most guidelines on how to drive car in city traffic have suggested the implication of blinkers during driving. Turning on small by lanes and narrow lanes should be preceded by blinking of indicators as suggested by most car driving tips. Also, another important thing is to keep the car in the correct gear, which might just extend the life of your car. Keeping your car in the wrong gear might also case jerks and power off your car. These safe driving tips while driving might transform you from an amateur to a professional driver.